I am trying to know how to connect to SAP HANA on Cloud platform from Tableau desktop. Are there any references detailing these steps? Thank you Dmitry. But, do you know the exact name of the drivers to be installed, as I see multiple downloads when searched for "hana on cloud"
I've heard stories like this multiple times about how hard is it do download stuff for SAP but, unfortunately, I don't have an account with them to guide you through this. Take a look at their help and some random guide from the web. Hi Naresh, I am looking at your post related to connecting Tableau to Cloud Based SAP HANA. Your initial post shows the message "This question is unanswered". Were you able to connect Tableau to Cloud Based HANA? If so, was it Ken Wong's link that gave you the information needed to properly set it up? We are looking at this and I want to be prepared. In order to connect Tableau to SAP HANA (on-premise or HCP hosted), you'll need to have the SAP HANA client drivers installed. I've written a post about this on the community with instructions, which you can check: Re: Which driver to I need to install to access a SAP HANA database? As for connecting to a HCP hosted HANA instance, the simplest way is to use the SAP WebSDK and open up a tunnel to the instance. 3. Go to the /tools folder and you'll find a neo.sh and neo.bat file. 5. The script will now ask for you instance password and then connect the tunnel to your HCP tenant. The tunnel will remain open for 24hrs as long as this window is open. 6. In Tableau, select SAP HANA from the connectors and add localhost, port 30015 to the connection details. After the connection is made, then just navigate to the __SYS.BIC schema and select the views you've created in HANA to start analysing. 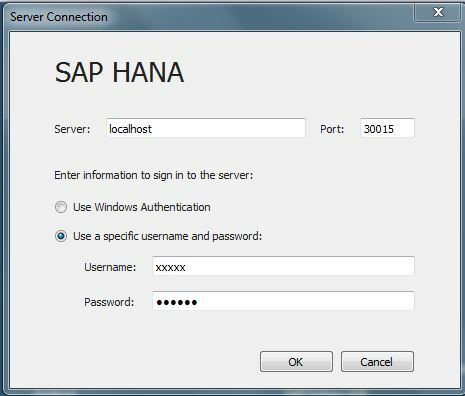 This is the "easiest" way to get a direct connection to HANA that resides in HCP. The more elegant way is to have the SAP Cloud Connector running on your workstation as a background service. You sir, are a HERO!